Welcome to the 4:00 pm hour of our World Card Making Day celebrations! Don’t you just love a day dedicated to something you love? We hope you’re enjoying what our team has put together. This hour we are excited to share more beautiful cards from Design Team members Melissa Phillips, Meghann Andrew and Virginia Nebel! 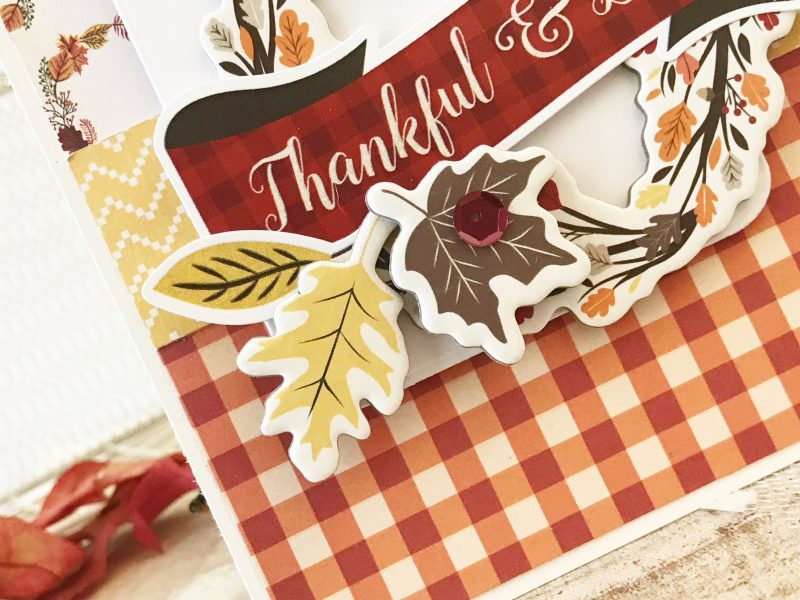 “Fall is such a great time to create Thank You cards….everything we celebrate this time of year centers around gratitude, including the warm, rich, cozy Autumn products available. I’ve mixed two fall collections together to create my card today, both from Carta Bella, the Hello Fall and Fall Break collections. In the background, you’ll notice patterns that create a fall feel, such as gingham, and florals. 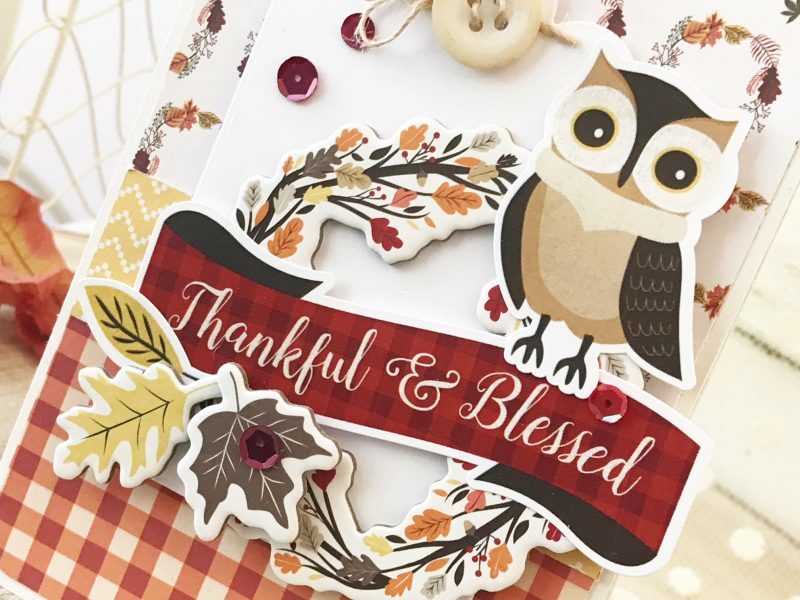 My focal point reemphasizes the fall feel with a chipboard wreath and leaves and cardstock stickers to embellish and bring in my sentiment of thankfulness. 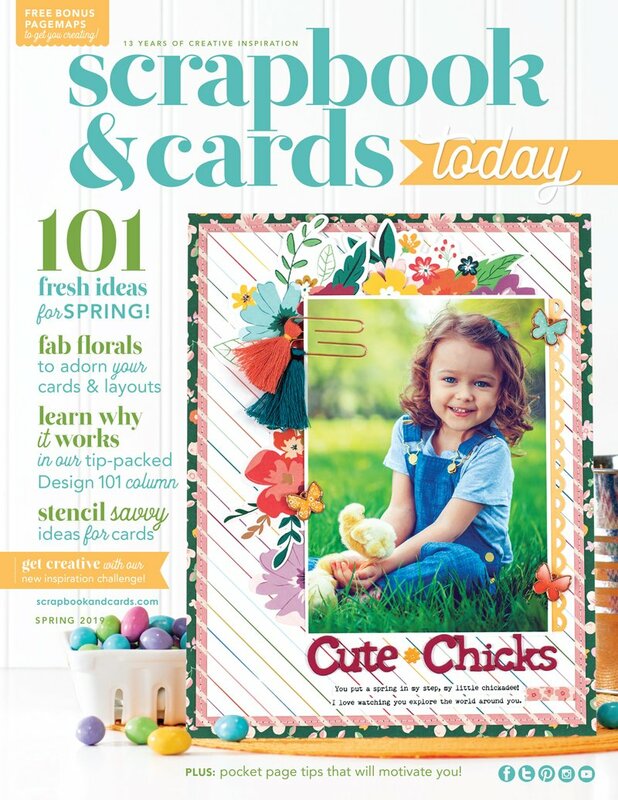 “Hello there and happy World Card Making Day, SCT readers! It’s Meghann Andrew here, and card making was my first foray into the paper crafting world. I love the small canvas of possibilities and the idea that what I create could make someone else’s day. 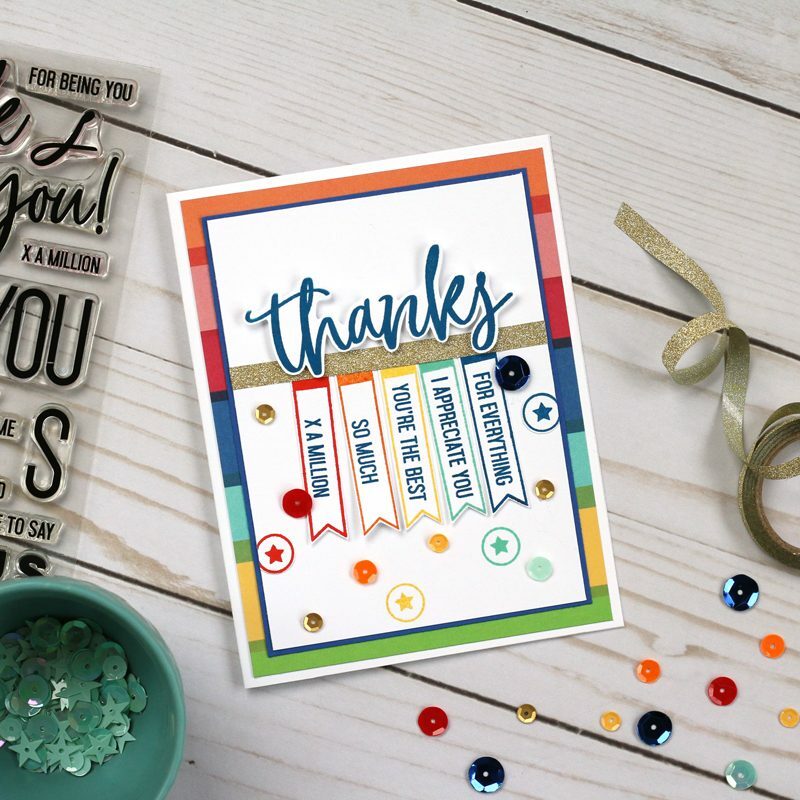 Thank you cards are my most sent greeting, and today I’m excited to share a fun and easy thank you card created using Elle’s Studio Thank You and Noteworthy stamps! This card is simple, yet packs a big punch. 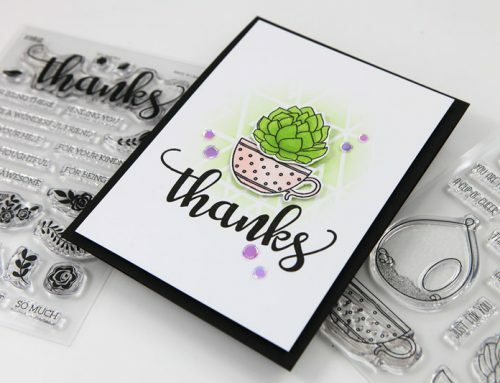 When I decided to use the “thanks” script stamp, I wanted to choose a second greeting with it, but couldn’t decide between all of the lovely ones on the Thank You stamp set. I decided to use them all, and arrange them in rainbow colors to match my striped, patterned paper background. I chose all of the phrases that fit inside the Noteworthy banner flag, stamping the flags in rainbow hues, and leaving the phrases in navy to match the word above. I needed a horizontal line to “hang” all of these flags from, so I grabbed the new gold glitter washi tape from the American Crafts Shine On collection. I love seeing that sparkle against all of the bright colors! “Sending a ‘Hello’ card will surely let someone know they are special! It’s sweater weather lately and I’m inspired to create an Autumn ‘Hello’ card. My card making approach is to keep it simple. I dug into my stash of ccardstockscraps and chose a dry embossing folder. Dry embossing is a great way to add texture in the background letting your embellishment be the star of your card. I placed the card stock pieces flush to each other so that the embossed design would be continuous in the background. Thank you, Melissa, Meghann and Virginia for creating these beautiful cards and sharing your techniques too! To celebrate this hour and our course to ensure you have some new products to work with, we want to give away two of our SCT Delivered card kits to TWO lucky winners! 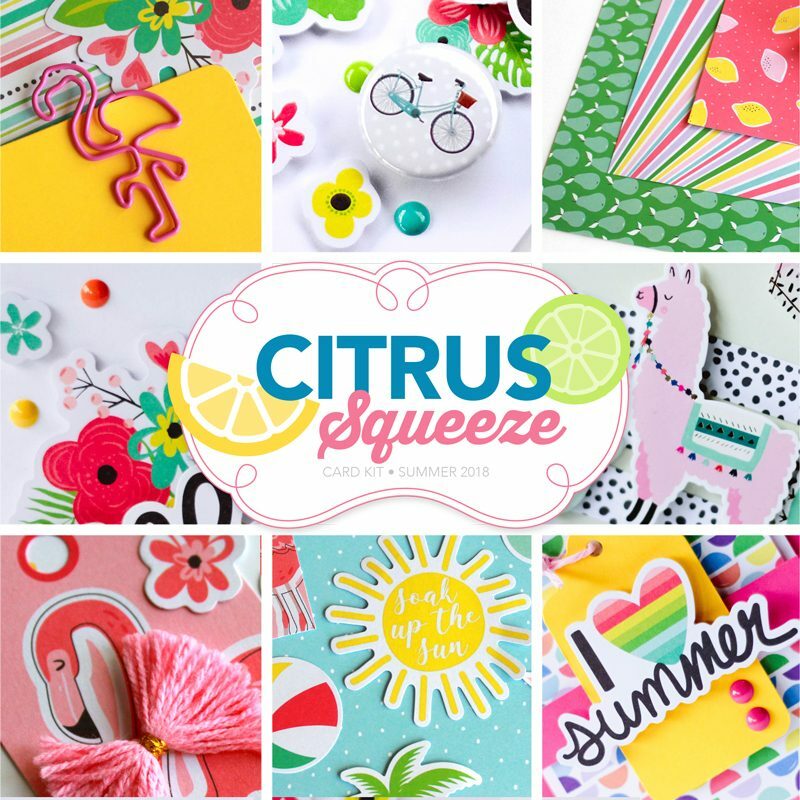 One winner will win our Forever Fall card kit and one person will win our Citrus Squeeze card kit! For an opportunity to win either of these kits be sure to leave a comment below by Thursday, October 11th. Winners will be announced on Friday, October 12th. In your comment tell us what cardmakers inspire you the most! Good luck! Please join us one more time at 5:00 as we do a wrap up of today AND we have a $250 prize package to share too! My favorite would have to be Jennifer McGuire. I love how she shares techniques and what works for her. We watch her YouTube videos all of the time. I love Virginia’s use of embossing multiple papers at the same time…and fall is my favorite time of year! As I am relatively new to the card making I don’t know many card makers. My mother, however, inspires me every day to use my creativity. Thanks for the chance to win the many prizes you offer. I love so many but Kristina Werner and Sheri Reguly are my two faves. great cards, I love the Echo Park and Carta Bella card kits. I don’t really have a favorite cardmaker, there are so many great ones out there! How can I narrow to one? There are so many out there! I really love Virginia’s cards! Thanks for the chance to win! These cards are beautiful!!! And card kits from SCT are always awesome!!! I love all the cards and card making ideas. Such good inspiration today. Would love to win either of these kits…. Summer is over but Fall is just beginning! Thanks so much!! So many talented card makers out there that inspire me but I love Vicki Boutin’s cards and Nicole Nowosad’s too!! Thanks for the chance to win one of the card kits…both are gorgeous but that fall one speaks to me! Thanks to Melissa, Meghann, and Virginia for these charming cards! I’m inspired by many cardmakers, and at the top of the list would be Jennifer McGuire. She has great use of color and awesome creativity, and as a bonus, she is extremely generous and kind. She’s inspiring! Marcella Hawley from Power Poppy. her post in the mail every day. Please do not make choose just one card maker, they all had great & useful ideas! Thank You all! Love the embossing! Jennifer McGuire is at the top of my list for her extreme kindness in sharing all that she does. She is a top notch paper crafter. Of course there are so many more talents out there in card making land. I have so many card making idols! My current fave is Stephanie Klauck – her creations are very inspiring. This card is fabulous, and I am definitely stealing the idea of using different colors of card-stock at one time in an embossing folder to make a background!! The card is very autumnal and since Fall is my season, I really like it!!! It would be great to the Fall kit, too. 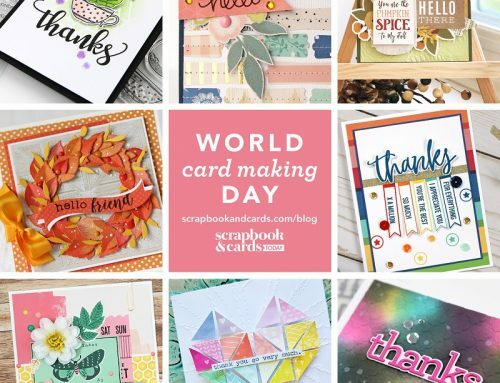 Thanks for the chance to win it on this World Cardmaking Day. Both kits look adorable! Thanks for the inspiration projects and the giveaway! I especially love the fall cards, so lovely! It’s hard to pick just one cardmarker I admire but it would have to be Jennifer McGuire, I just recently started following her, she’s amazing! Love these fall cards! Thanks for the inspiration! I began card making with Kristina Werner. She is still my favorite. Jennifer McGuire and Laura Bassen comes right behind. Thanks for the inspiration today and everyday. These kits look fun to use. There is so much talent out there, thank you so much for sharing. It’s hard to pick but Kristina & Jennifer are at the top of my list followed by Yana Smakula. There are so many who inspire me! Jennifer McGuire, Yana Smakula, Jessica Frost Ballas to name a few. I love Jennifer McGuire’s style. I love these cards! I think that Carta Bella line is gorgeous! Wonderful inspiration…thanks so very much ladies and Happy WCMD!! I love so many card makers, and Jennifer McGuire is my favourite. She always reminds us to be kind, and to encourage others. Oh that’s a really tough questions. Jennifer McGuire is my best inspiration for techniques, but for general design there’s just too many to name! Jennifer McGuire and your own Susan Opel are two card makers who really inspire me. I am loving all the inspiration today….thank you! The continuation of the embossing folder over the 3 colours is great idea. Love the results. I am continually amazed at how the simplest ideas are often the most effective. Never in a million years would I have thought of dry embossing strips of colored cardstock abutted against each other .. so Virginia Nebel’s example of that just set off explosions in my brain! What an utterly brilliant idea! I absolutely love the card by Virginia Nebel. What a awesome idea to use up my scraps! So would have never thought of that idea but can’t wait to try it! Running to grab my embossing folders right now! I love people who share ideas and different ways to use items we already have! Very inspirational! Thanks Virginia! Such beautiful cards! 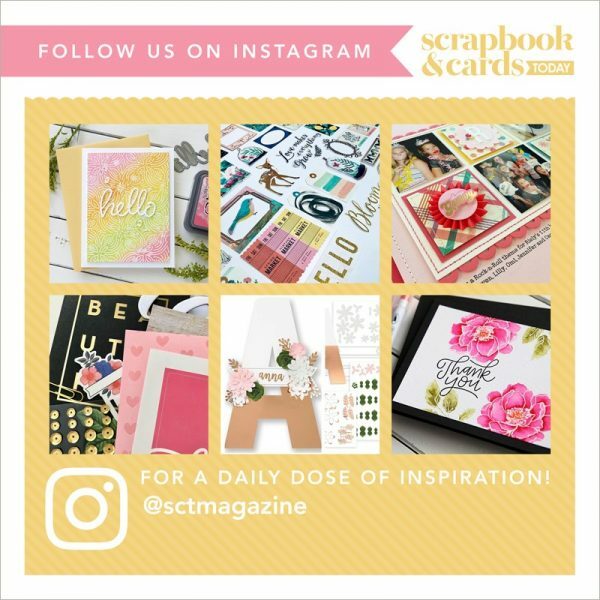 I am inspired by so many card makers out there – your team here at SCT as well as Justine Hovey, Jennifer McGuire and many more. I love how the embossing was done on this card! Thank you for the inspiration and the chance to win an amazing kit!! by these card designers today, hard to pick just one for sure. I do enjoy Jennifer McGuire and Nicole Nowasad unique ideas..
but everyone today, has come up with some wonderful projects. Fabulous card ideas, I have to say I love Debby Hughes style of cardmaking! I love the card kits and the cards that you have made. thanks for the inspiration. Makes the fall cards so beautiful with all of the colours that you have used. All beautiful cards. I especially like the banner idea on the thank you card. I love these thank you cards! Thanks for sharing! Great cards. Fall is my favorite time of year. That’s a tough question. If I had to choose (and I wish I did not) it would be Jennifer McGuire. What fabulous fall cards! i love the creative use of the embossing folder. so many cardmakers inspire me Jennifer McQuire, Laura Bassen, M. Pranter, Channin Pelletier, Francine Vuilleme and so many more. Beautiful fall card kits for my favourite season. I’ve just started following Jennifer McGuire and like her technique videos – easy to follow and great ideas! I receive the SCT Sampler every month and you do such a great job of curating them. It would be wonderful to win one of your full kits as I’m sure the same thought goes into them. I follow so many card makers it’s hard to pick just one, but Jennifer McGuire is one of my top picks. Love Jennifer McGuire but also love my fellow Canadian Amy Rysavy!! I must say that Melissa’s card is my favorite. Love the colours and the warm feeling it gives me. Love Jennifer McGuire and Cathy Zielske! I follow so many cardmakers it’s hard to pick a favourite! I love getting inspiration from lots of different people. I loved all the carmakers cards! 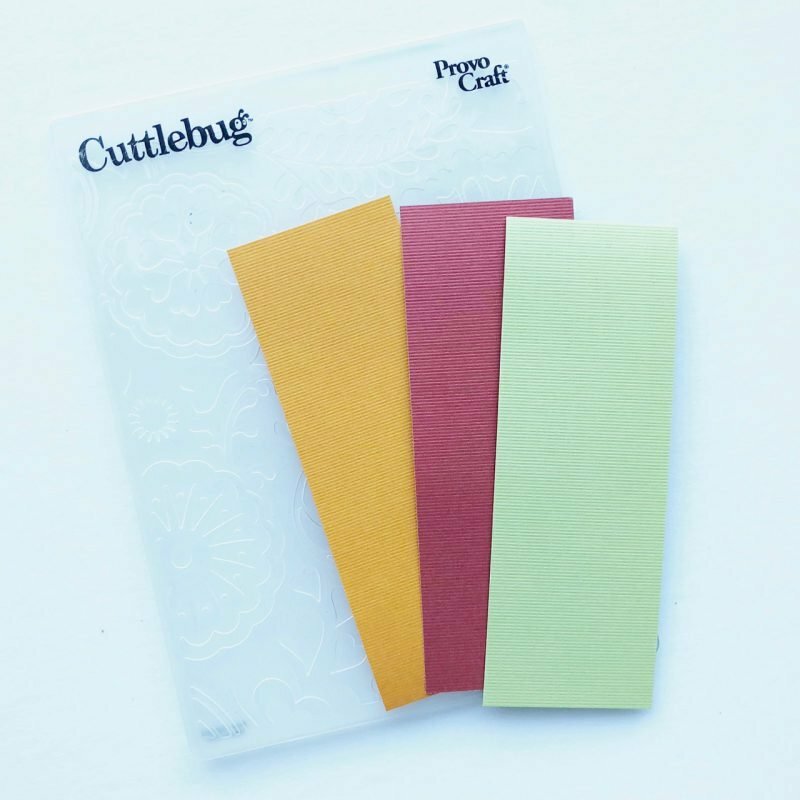 Great ideas for future cardmaking. Would love to win the kits too! All of the cards are so gorgeous! I love to play with new product! Having such a fun day following along on the SCT website! Thank you so much for chance to win this lovely prize! These cards really capture the fall spirit. I love them. How exciting!!! I just love Kristina Warner. Wonderful cards – so much fun! Such fun cards! I’m inspired by so many crafters, two being Jennifer McGuire and Nichol Spohr’ both fabulous designers. 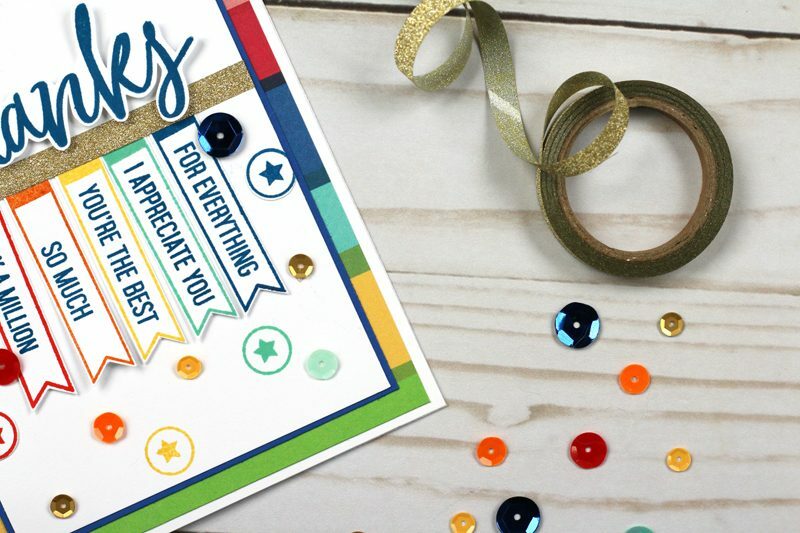 Great idea of using embossing folder on different colour cardstock to create unique pattern on the card! Those kits look amazing! 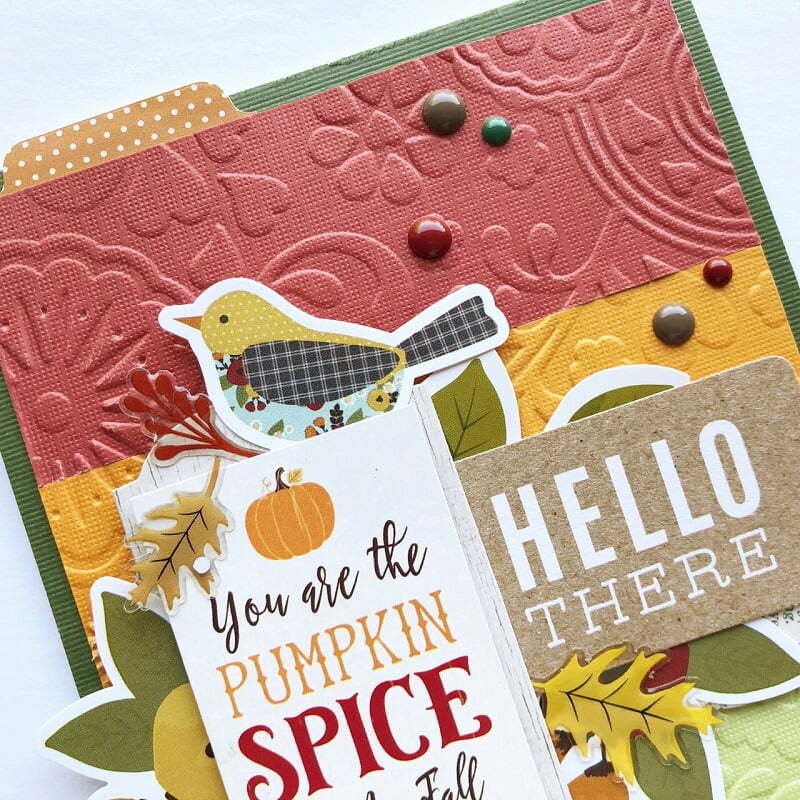 I recognize Carta Bella Hello Fall in some of the cardmaking! Nice prizes! I will take either of those kits. Thanks! Gorgeous cards and great ideas! There are so many card makers who make very amazing cards and it’s hard to choose. I think Jennifer McGuire makes cards that I can relate and use in my life. That’s a tough choice, there are so many inspiring carmakers out in blogland! Kathy at the Daily Marker and Jennifer McGuire are two of my faces. There are lots of card,Akers who inspire me but I have to say Jennifer McGuire inspires me the most. 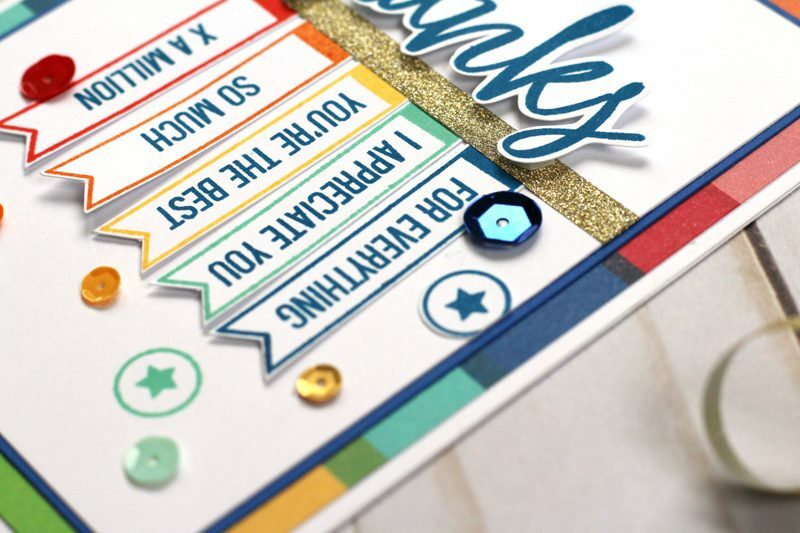 She creates such pretty cards that are doable for the average crafter. gorgeous cards…. love the fall stickers and colors! I love seeing designers’ cards. They give me new ideas about using supplies differently than I originally thought. Love the cards especially the layering/textures. My favorite all time inspiration designers are Jennifer McGuire and Kristina Werner. I also love the color choices that Dawn McVey makes, they make my heart sing. 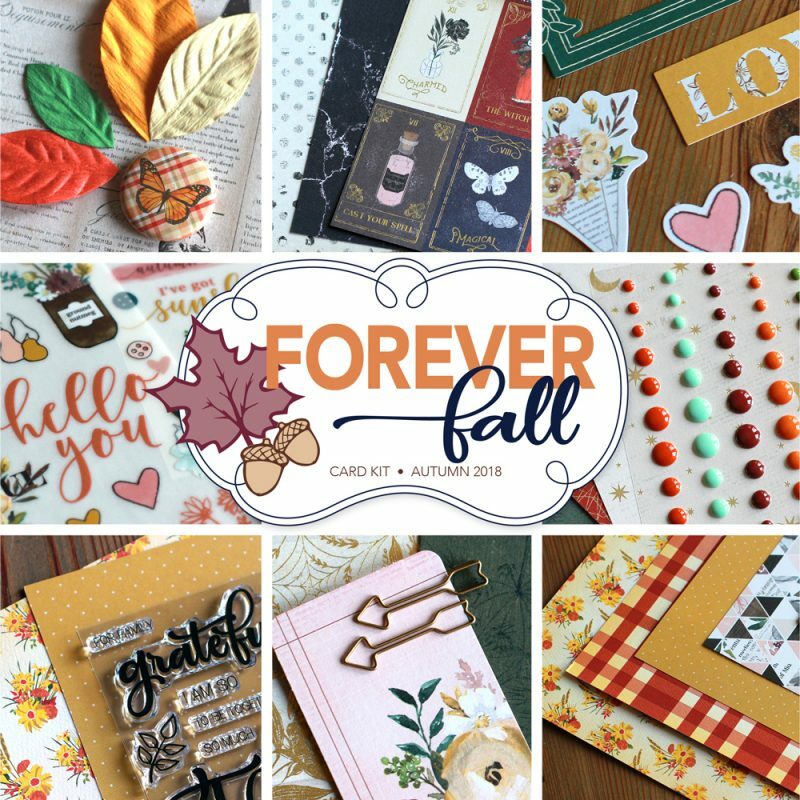 Fall palette; fall images…I’ve fallen in love with the cards showcased! The two kits: fabulous prizes! Two card-makers inspire me: Amy Rysavy (prairie,paper and ink) and Yana Smakula. Their talents – and generosity in sharing it – is marvelous. Jennifer Mcguire, Kristina Werner, and Amy Rysavy are my favorite card makers! I love Jen McGuire and Kristina Werner. Can’t believe it’s already fall! What beautiful colors! Love Melissa’s stunning card. She’s my inspiration. Beautiful cards. I always find Virginia Nebel’s cards inspiring. I love the idea of embossing different colour papers in the same folder – will definitely use this idea for future projects. J’adore l’idée du gaufrage avec plusieurs papiers, je vais utiliser cette idée sur mes créations. Les kits sont beaux mais avec une petite préférence pour celui aux couleurs automnale. I love card kits – especially when the cards are so pretty! I pick cards based on need and appeal. I would not pick a fav card maker. Everyone has cards to be inspired by. Virginia Nebel is one of my all time favs. I had the ones of taking a class with her at a Crop & Create and it was one of the best. So much beautiful layering on these pretty cards. There is so much wonderful inspiration online from so many talented designers, I would not dare make a list. Thank you for the chance to win one of these prizes. I would recognize a Melissa Phillips card anywhere. I follow several card makers and they are all wonderful. We have an array of talent in our his industry. Inspiration is everywhere. Thanks! I’m just the biggest fan of Paige’s cards. I am every time amazed with what new ways she comes up regarding the art of stitching, both in her scrapbooking layouts and cards. Love the embossing folder use! Oh gosh, favorite? I can give one word description as to why I love many…Jennifer M – genuine, Kristina W – talented, Laura B – hilarious, and so many more. The crafting world seems to be the least judgemental and genuinely uplifting and helpful. They are gorgeous and fabulous cards. I love each design! Thank you so much for a chance to win the prize. Thank you for all of the card inspiration! Jennifer McGuire inspires me the most but there are so many others that I also get inspired by! Those cards give a nice cozy feeling. Perfect feeling for the rain we are getting here. Gorgeous! I love the fall colors! Love the fall cards. Some of my favourite card designers are Jennifer McGuire, Kristina Werner, and Jill Foster to name jsut a few of the very talented ladies I follow. 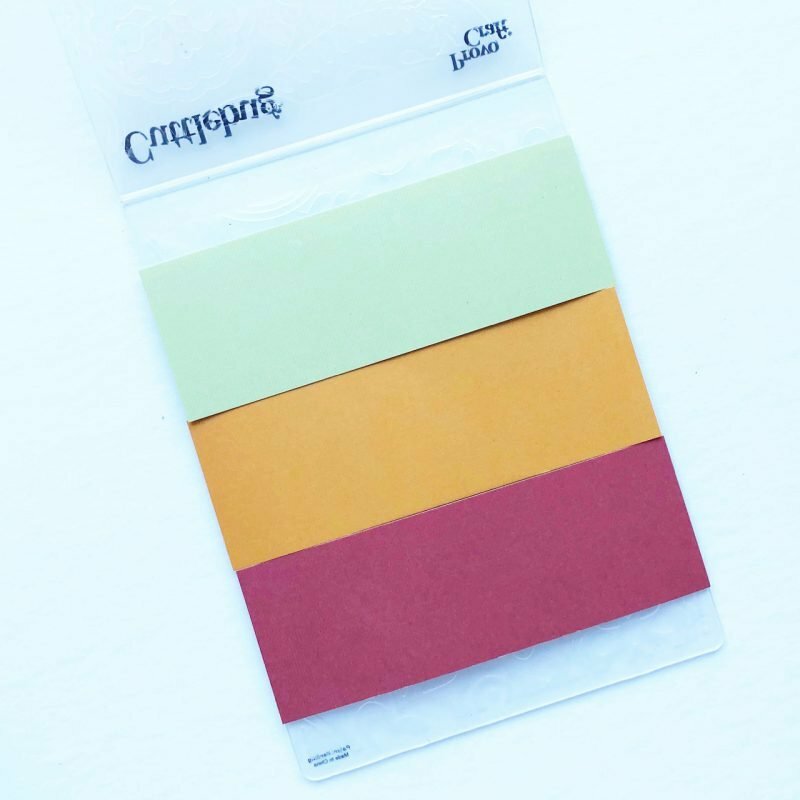 Lovely cards, beautiful color palettes. Gorgeous kits – so much creativity waiting to happen. Such lovely cards ladies. Great idea Virginia. These colors make me feel warm and comforted! So pretty! TFS! Such beautiful cards! I am inspired the most by Virginia Nebel. Thanks for the chance to win an amazing kit! Love Virgina Nebel’s cards and am so inspired by her style. Would love to win one of these SCT card kits! WONDERFUL cards … loving all the layers and embellishments! Wow! Both these kits are simply amazing! Love so much their colors!!! Love the colors in both the fall and summer kits! I love everything Virginia – and her idea of dry embossing different papers with the same folder – awesome! I am definitely a fall person and the fall kit would be a welcome edition to my fall stash. Thanks for the chance to win. These cards are all gorgeous! 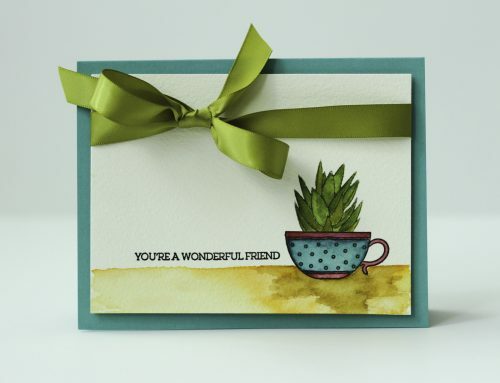 Jennifer McGuire and Kristina Werner are two cardmakers that inspire me so much! There are many more I follow on Instagram and You Tube such as Kathy R, Gina K, Laura B, and of course Cathy Z who inspires me with her beautiful CAS card designs! I’m a fan of Jennifer McGuire and her technique videos. Tenia Nelson makes so cool cards with simple and clever designs. Anna Uhras is a CAS perfectionist. I love these cards! Thanks for the chance to win one of these awesome kits! 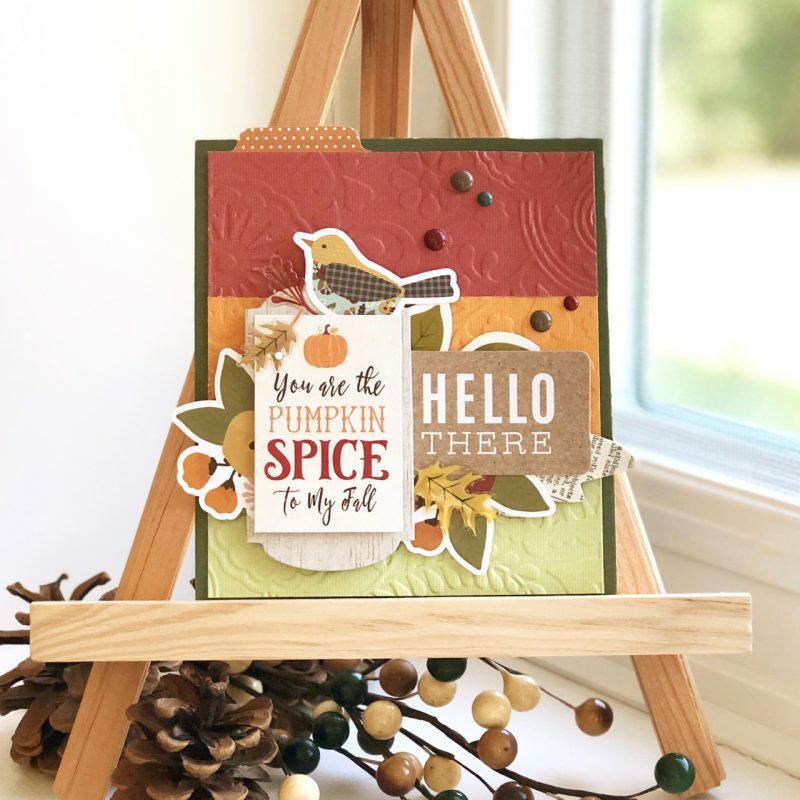 I love Melissa and Virginia’s beautiful fall themed cards so much, and a big favorite of mine is Kathy Racoosin, whose coloring tutorials are amazing! Yikes! Seriously?! Pick one? Ummmm okay, I pick my daughter Emily as my favorite card maker because she can take and idea and transfer it into something wonderful in not time flat. But if you mean choose someone with an online presence, I would say Yana Smakula because her cards just resonate with me. Awesome! Both kits are amazing!!! The fall one would be perfect for our weather right now!! So hard to pick but I am a fan of Jennifer McGuire. I enjoy Amy Rysavy’s creations! I’m new to cardmaking so I don’t know any names yet but events like this give me great exposure to different card makers. Thanks for the opportunity learn different techniques and the opportunity to win one of these prizes!!! What great cards! Both kits would be fun to win. I am new to cardmaking so I do not yet have a favorite card maker that I’m inspired by. 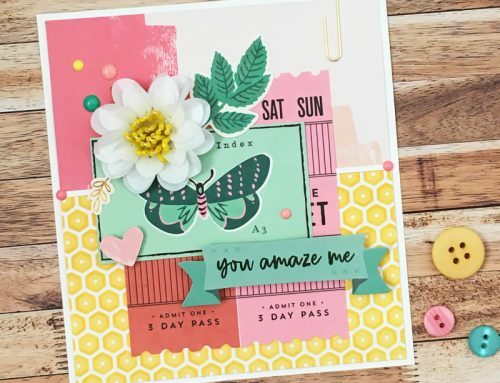 All of the card makers that you have been featuring for World Card Making Day have inspired me so far with their style, tips, and designs! I would love to win either of the card kits being offered as a prize. great cards and idea to use strips in the embossing folder. Thanks for the chance to win. Thank you for the chance to win one of your kits! I love your kits!! 🙂 Amazing inspiration from such talented papercrafters!!! Love, love, love the Fall cards. My favorite season and what great giveaway kits! I really love watching Kristina Werner’s videos. Such an inspiration! Virginia’s cards are simple and beautiful – really like her style. Thank you for an opportunity to win one of your kits. I love card makers who mix elements to enhance a card’s texture without being too lumpy and bumpy. I mail most of my cards, so I’m always walking a fine line. Wanda, at “A Blog Called Wanda” is one of my favorite card makers. She has a great way with color and textures. I loved Virginia’s card! I would be thrilled to win one of SCT’s amazing kits!! Love these cards. Wish someone would send me a card like this🙄. Okay, I need to look into the cards kits. They look awesome. Would love to win one, but hey, if not, guess I will buy one!!! Jennifer McGuire and Kristina Werner are two cardmakers who inspire me. Thanks for the chance to win the card kits! The three cards are beautiful and very different from each other, just like the two kits you giving away. Hope I’m lucky enough to a winner. Love the cards. Great designs on all the cards. Cards are inspiring and they can be made with the scraps that we all have on hand. Thanks for all the ideas shared here. Love the kits as well. Love the embossed card. So many options. I’d share with my friend Sue! 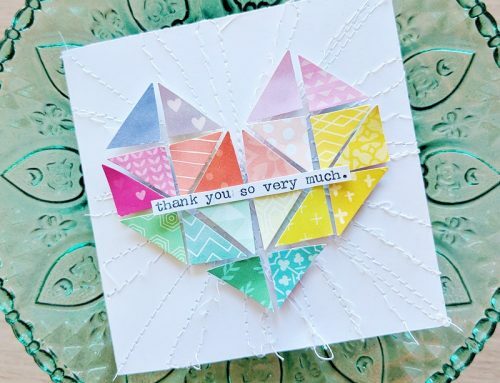 I am inspired by so many cardmakers but a favorite is Jennifer McGuire because her tutorials are so easy to follow!